Wow Ayumu you win !!!!!!!!!! Given the pattern so far, it would seem like it. Hata did once say that Maria's arc would be near the end. 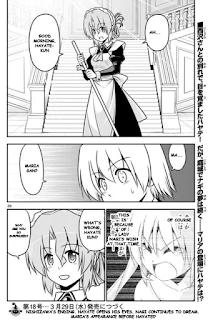 I don't think Maria's final arc should be some kind of romantic dream with Hayate though. 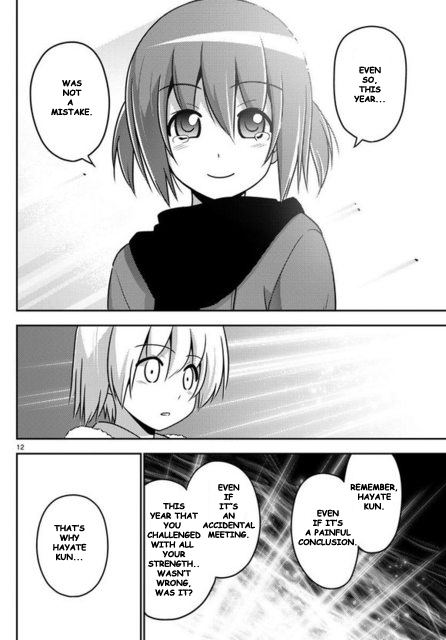 All she's shown throughout the series are faint signs of attraction for Hayate and Hayate himself has/had a crush on her but does not feel that strongly about her -- at least based on the fact that he was even thinking of using her to induce an explosion of negative emotions for Nagi's sake. 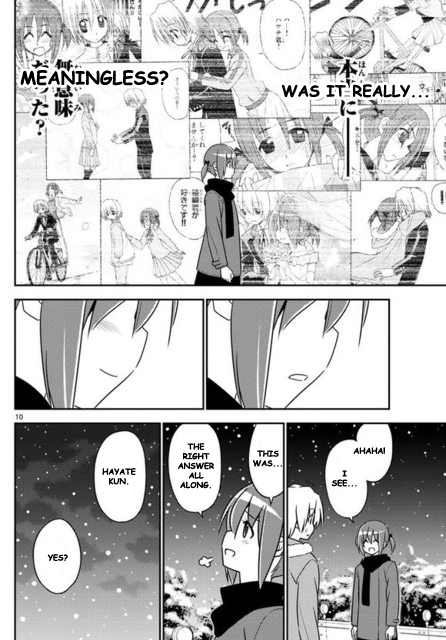 are the real hayate in Nagi's dream at the last of the page?? Well, based on that page, it would seem that way. 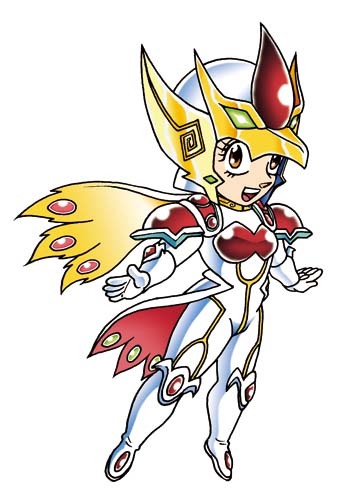 I was also thinking that: what if it's actually the real Maria and Hayate in that dream with her? She just wished for "a world where Hayate loves me" after all. What if Hayate was actually in love with her all this time without knowing it, so all that the royal power needed to grant was the enclosed world and it just took the real Hayate inside. Also, that scene we saw wherein a seemingly fake Hayate said that he loves her could have been a flash forward... well, there are all kinds of problems with this theory, but it's not implausible. hmmm, when i think about it you might be right about that, but well let's see chapter 566.
i kinda sad when Ayumu and Hayate kiss though to be honest, even ayumu made the first move to kiss him and they kiss in the dream world. and btw if i re-read some parts of the manga, i see most of the girls who has a crush on Hayate made the first move to kiss him than him (except Athena of course when they little), i hope in this "final arc" if there a kissing scene with Hayate and Nagi, i hope Hayate will made the first move. 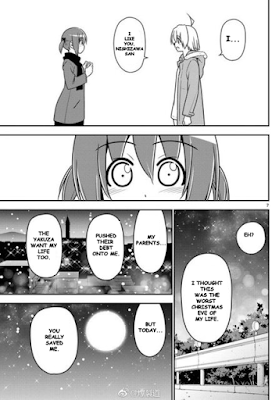 Wow, that hamster became an angel and spread her patience and acceptance for bad situations into hayate. These characters are having their goodbyes according to their reversed appearence in the story. And hayate is behaving a lot like tsubaki, all knows he loves nagi except him. Ayumu spoke the same words that hayate did to athena. Hayate once said he wanted to tell someone again that he love her, the time seems to come soon. Like the posters of ctmeoy, those hands surely hold a miracle. It would be good if kazuki's perspective was used to describe nagi's feelings for hayate as all the girls observed hayate's too much care for nagi. Kazuki could be more useful in the story but he is not needed here anymore. I wonder how the 4 songs will be used in these remaining chapters. Anyway the ending is going to be better than any alternatives that I can think of and it is going to be my favourite manga of all time. Yup... I mean, I just can't accept that he DOESN'T LOVE NAGI ROMANTICALLY after all this. Also, when Hayate said that part about "will I ever be able to tell someone that I truly love them again?" Nagi was shown in the panel. Anyway, I hope Ko No Me Kaze or Heaven Is A Place on Earth is used as one of the chapter titles. 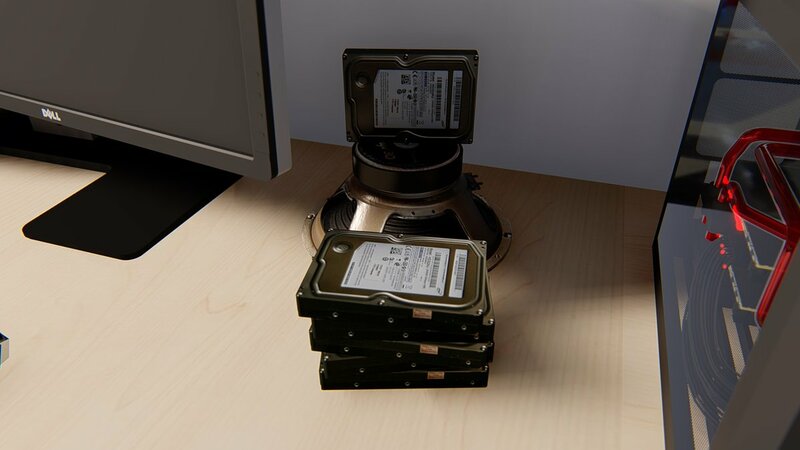 I'm really looking forward to this chapter. This is a great positive moment for our ship. And I think the emotions have been drawn beautifully. Whether it be not thinking himself to be deserving enough or trying to convince himself that he only wants to protect nagi, he just doesn't want to explore and accept his actual feelings for her. He puts nagi on a much higher level than he believes he does which is why he has never considered himself as her romantic counterpart. But anyway. He had to face this one day or other, denial was never going to help him get anywhere. At this point, i think even if he confesses to her at the last chapter, I'll still accept that because at the end of the day, I'm a hayate x nagi supporter. Very nicely put. 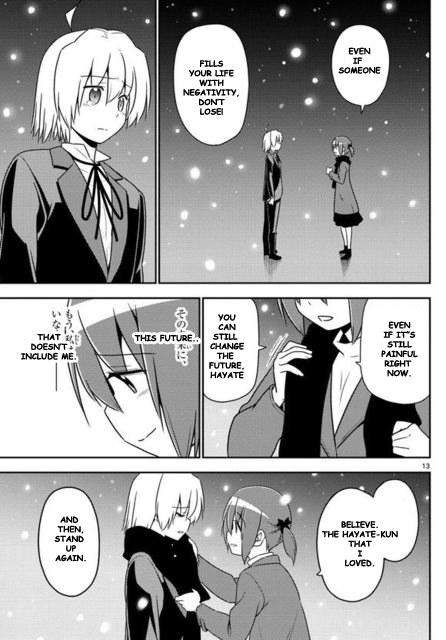 I think we Nagi shippers also deserve a straight answer from Hayate as well. Why does he want to protect her so? If it's because she saved him from the Yakuza and his parents on the worst Christmas Eve of his life, then... look where that led to in Ayumu's case. Also, realistically, Ayumu couldn't have saved him on that night anyway. The Yakuza would find him and hunt them both down eventually. From what we've been shown here, it doesn't look like he's even strong enough to fight them -- in fact, the only time we've seen him at the peak of his strength was when it was for Nagi's sake... so yeah, we and Nagi deserve an answer as to "why?" So yeah, even if the confession happens a the final chapter, it's fine with me. Hayate and Nagi's love does not need to be the lovey dovey romance that we've gotten used to in other harem series. I think it really has the potential to be one of the most beautiful love stories ever told this way --- and in my heart, THE most beautiful love story ever. Now it's easy to assume that he was going to say that he wanted to protect her... but that would be pretty silly. "Truly, I wanted to protect you?" What would be the point of that if there was no love behind it? "I really wanted to protect you. I really did." Hayate: "I wanted to protect you. Really I..."
Nagi: "Then... do you love me?" "I really love you." instead of "I really wanted to protect you?" Again, haters are going to go on a tangent and use the "it's all platonic nonsense," is that really how it is when Hata has been making the eventual ending pretty clear these past few chapters? I sure hope not. The main reason why many people think that hayate does not love Nagi is because he has never confronted it himself in a direct yes or no way. When there was hesitation on part of hayate, at first glance it seemed like he didn't want to make her sad by saying no. 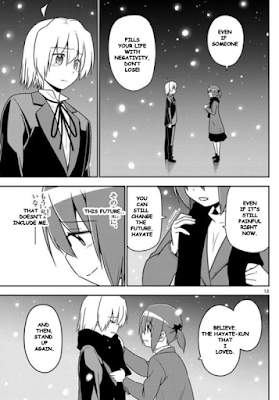 But hayate himself is such a confused person that there is no way such an obvious thing actually happened. When asked the question, the immediate response is yes or no. At that moment I don't think hayate knew the answer himself​. Not hurting Nagi anymore was definitely part of his emotions at that time, but I think he himself was contemplating the answer-whether he does love Nagi or not. The hesitation was interpreted by Nagi as rejection as was by many readers but the confused fellow like hayate is, there is no way he rejected her. Rather he was trying to get an insight into his real feelings but he didn't get enough time to do that with Nagi's intense anger and sorrow. Thank you for your insights. Reading this really made my day. I mean. at the end of the day, our guess is just as good as anyone else's, but people who are still following this manga are really doing themselves, the author, and Hayate a disservice by underestimating the way he thinks. Someone with a personality as complicated as Hayate (and you can see how it came to be through his past) isn't so much of a simpleton to think of things in terms of straight up black/white, yes/no. Like you said, he has never really confronted his feelings about Nagi before (choosing to postpone and delay it instead) and Nagi basically forced him to do so at that particular moment. I've always said that I don't expect him to respond favorably to her right away -- which is exactly what happened at that time. The way ayumu says, "I truly loved you" is similar to the way hayate told Athena, "I loved you". It probably was done to show the similarities between hayate and ayumu. It was very beautiful. The "I loved you" thing is really a recurring motif at this point. 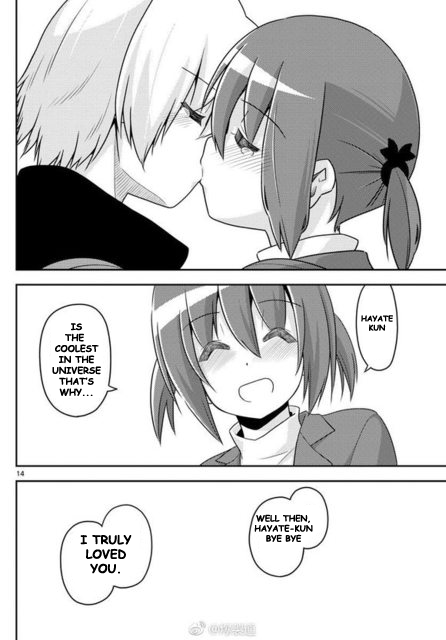 Hayate x Athena, Wataru x Isumi, and now Ayumu x Hayate. Hopefully, it won't turn out that way with Nagi x Hayate -- I strongly believe it won't be that way. Why kill a love that hasn't even been given the chance to blossom yet?